Those of you who have rung on the original four bells at Campsea Ashe will know that they were an “interesting” ring! They had been silent for most of the 20th century, before basic repairs were made in time to ring them for the Millennium But they were never in tune and their sound quality was poor. Apart from these drawbacks, they were hard work and had the charming habit of “going up wrong!” The idea of restoring them arose when a quarter peal attempt was cut short by a weight falling from the clapper of the second bell. Somewhat alarming, but no damage was done. 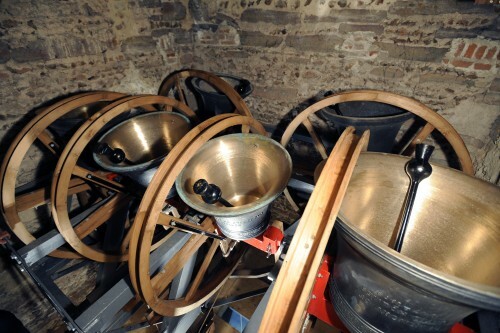 So the Campsea Ashe Bells Restoration Project was launched in September 2007.The decision was made to leave the tenor in the original frame as a service bell and incorporate the treble, second and third as the four, five and tenor of the new ring. We would then need to cast three lighter bells as the treble, second and third of the new ring in a frame beneath the original one. Fund raising activities began in the autumn of 2007. These included sponsored quarter peals, tracing family ancestry, the Talents Challenge (where a collection of people were given £20 to start a fundraising event or scheme), three choral concerts from Scratch, other concerts by visiting musicians, two Ringing festivals and two sponsored 10k runs in Woodbridge and Framlingham. Numerous grants were applied for and various well-known people with Suffolk connections were approached for financial support. There were many generous individual donors, also donations from towers and ringers across Suffolk. We were also fortunate to receive a large sum from the Heritage Lottery Fund for our project, also for developing the Church as a heritage centre for the community as well as a place of Worship. So the funds climbed. Our three new bells were individually sponsored, the treble by the people of Campsea Ashe and the second and third by family donations. At the beginning of 2010 the gallery was built. We think it’s a superb asset to the church as well as enabling the ringing and ringers to be seen by the congregation. We chose Nicholson Engineering of Bridport to do the bells work, so the old three bells were removed in April 2010, the three new bells having been cast in March at Whitechapel. I imagine most of you know that those three new bells and our old third were stolen from Bridport in September. It was an unbelievable shock, but within a short time insurance was paid and four new bells were cast in November, again at Whitechapel. So the bells were hung by Nicholsons, along with volunteer helpers, and rung for the first time on Friday 10th December. We are thrilled with them. We practise each Saturday from 9 -10:30am. Do join us one Saturday! Locally, villagers have been most generous and supportive of the project, raising over £7000 to pay for one of the bells that has been dedicated to the people of Campsea Ashe. We also held numerous fund-raising events, ranging from Ringing Festivals to car boot sales to performances of Handel’s Messiah from Scratch in the church at Christmas time. We hope the bells will sound out over the village and be a witness for God for many hundred of years to come.